In this age of moral relativism, I find this tattoo very amusing. Moral relativism doesn’t come into it. He’s talking about the amoral, not the immoral. tiki, is that your backkcal area? The funniest part is that in 20 years it’ll look like some kid scribbled on his back in gibberish with a black sharpie marker. Is he talking about the “special hell” also reserved for child molesters and people who talk at the theatre? Toasterhead, I was referring to the decision to make a stance. For example: “my moral decision is to not make a decision about a moral crisis”. But I agree with what you said (and still find the quote amusing). Too bad JFK was the one who said that. 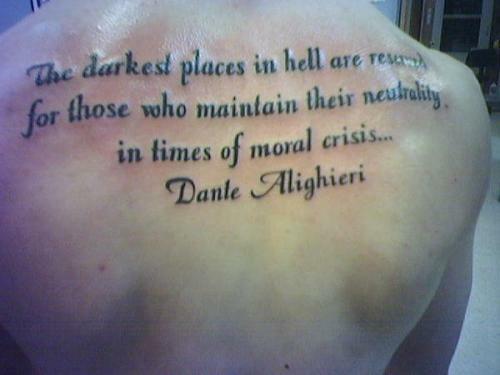 If John Kennedy said it, he was quoting Dante!